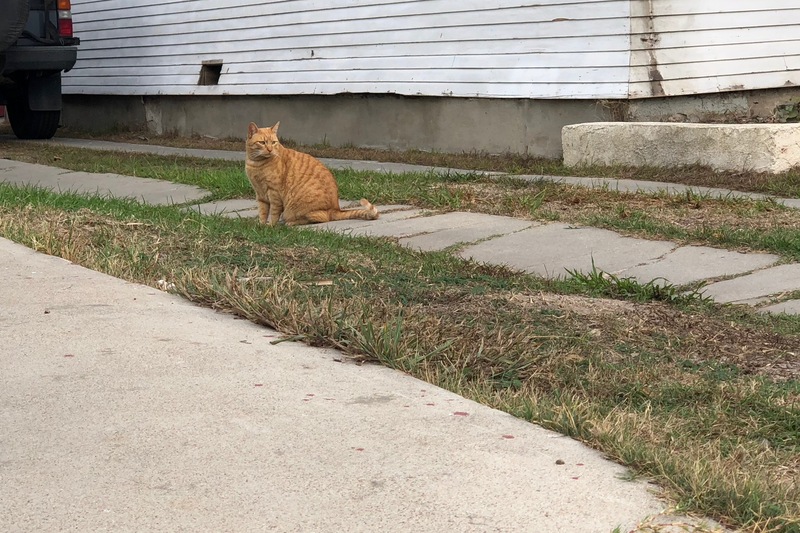 Dec. 10, 2017, as I walked down Louisiana, a handsome orange tabby presented himself—somewhere between Madison and Monroe, perhaps beyond. 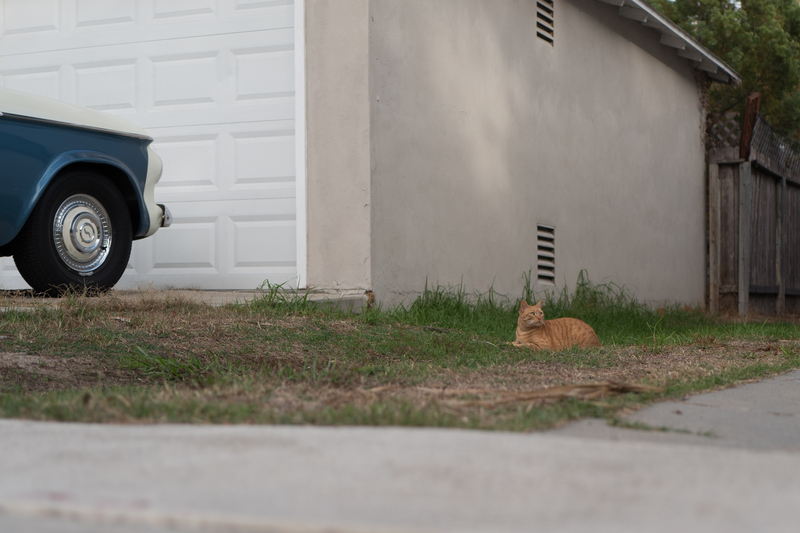 I thought at first that he might be a similarly colored cat spotted on the same street seven months ago. But on close inspection, differences are clear enough, and the animals displayed different temperament: One was friendly, the other standoffish. I nickname this husky, handsome shorthair: Brawn. We never got close. I shot the Featured Image, which is cropped about 100 percent, using iPhone X. Vitals: f/2.4, ISO 16, 1/216 sec, 6mm; 2:47 p.m. PST. I also carried along Leica Q, which I used for the next two close-crops. 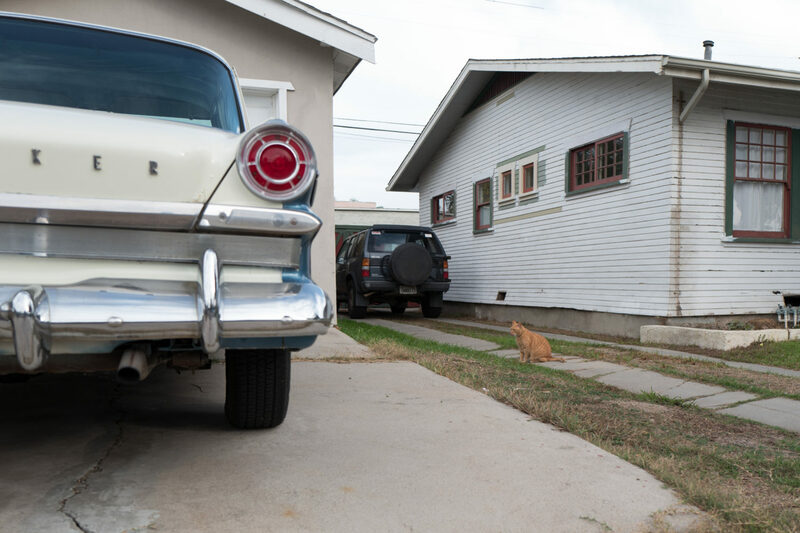 I chose the first of these mainly for composition with the old car in the foreground. Vitals: f/4, ISO 100, 1/250 sec, 28mm; 2:49 p.m.. The other capture showcases one of the camera’s best street shooting features: Manual focus, which was really needed going wide open from the distance; depth of field was narrow. However, clarity can’t be fully appreciated because I over-cropped. Vitals are same except f/2 and 1/1250 sec; 2:52 p.m. Aperture was manually set for both photos. Previously featured felines: Scruffy, Roly Poly, Woo, Skull, Biscuit, The Colonel, White, Chipper, Frisky, Stretch, Needy, Farfisa, Mates, Hunter, Pee-Pee, Blue, Blue Too, Bonded Pair, Patience, Fess, Jumper, Frenemy, Looker, Cozy, Scout, Lurks, Skit, Mini, Betty, Black and White, Stalker, Bell, Chill, Sammy, Scratch, Poser, Star, Grey and White, Watcher, Herman, Comet, Roman, Willow, Chub, Nimbus, Watson, Lilo, Kit, Pepe, Twilight, Sebastian, Spot, Booger, Ash, Veruca, Riley, Mellow, Bonde, Flower, Glass, Black, BeBe, Fang, Bruce, Siamese, Pounce, Tortie, Haiku, Fraidy, Peso, Daniel Tiger, Dusk, Stride, Dainty, Spry, Tabby, Betty Too, Still, Levi, Shadow, Sophie, Wink, Ferals, Momma, Charlie, Tux, Cool, Benny, Jellicle, Itchy Valentino, Goldie, Nine, Amanda, Siesta, ChaCho, Charlie, Too, Mika, Crystal, Seeker, Mittens, Dancer, Smokey, Monkey, Captain Blackbeard, Season, Maven, Tink, Chunk, Curious, Hanoi, Bella, Tarry, Guido, Maxine, Mr. Kitty, Peohe, Panda, Frankie, Sunshine, Twain, and Willow, Too.